Lytro claims its new camera technology records the entire light field. A US start-up company is poised to release new camera technology allowing photographers to set the point of focus in their images after taking the picture. California-based Lytro claims it has developed a new camera to be released later this year that uses 'light field' technology to allow photographers to take a picture and set the focus on any point in the picture later on the computer. Creating what it calls interactive 'living pictures,' Lytro says its new technology uses the light field - the amount of light travelling in every direction through every point in space - which conventional cameras cannot record. Using a new kind of sensor called a light field sensor, the company claims its camera "captures the color, intensity and vector direction of the rays of light. This directional information is completely lost with traditional camera sensors, which simply add up all the light rays and record them as a single amount of light." Lytro adds: "By substituting powerful software for many of the internal parts of regular cameras, light field processing introduces new capabilities that were never before possible. 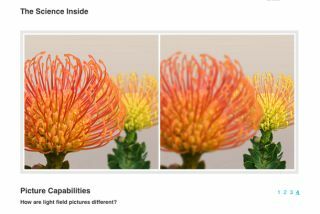 Sophisticated algorithms use the full light field to unleash new ways to make and view pictures." The Lytro camera's pictures would allow photographers not only to focus pictures after they are taken, but also shift their perspective of a scene and switch between 2D and 3D views, the company claims. For a more in-depth discussion of Lytro's camera technology, you can read the company CEO's dissertation. Or you can visit Lytro's image gallery to see some examples of its 'living pictures' and adjust the focus.